All my bags are packed, (I think) I'm ready to go...Singing that song is how I woke up my roommate this morning at 4:15am to drive me to the airport. (Best roomie ever--for taking me to the airport, and not hitting me for singing.) I, myself, woke up after my second of five alarms went off at 4:05am after an hour of sleep, with the lights on, because I was terrified that I wouldn't wake up. Anyone else have that fear or just me? Today was the day. I was starting the long journey to Lesvos to volunteer at the refugee camps. Here I am, in Boston, on my friend's couch, trying to put my thoughts to paper. I left Portland this morning and made my way to Boston with a quick layover in Minneapolis. I have the day tomorrow (plan is to rest and explore, it's my first time in Boston!) before I take off in the evening to catch a flight to Thessaloniki, Greece via Istanbul. I'll spend Friday night in Thessaloniki before I catch a flight on Saturday afternoon to Athens and then finally make it to Lesvos. 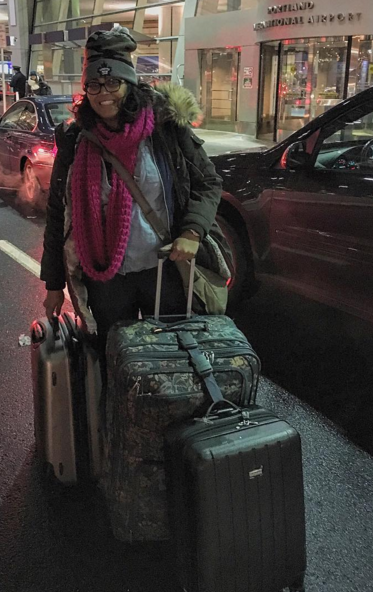 6 flights, 5 bags, 3 days, 1 adventure. How am I, you ask? In one word: overwhelmed. In a good way. So much has happened and so quickly and so much was on my list of things to do that my mind was spinning. Yet, I managed to prioritize sleeping in (who knows when I'll next get a good night's sleep?) and watching Luther (...because Idris Elba, duh.) But really, overwhelmed is the best way to describe how I feel. It feels surreal that I'm going on this incredible adventure. The posts that I've found from other volunteers about their own experiences and reflections upon returning validates that I'm doing the right thing for me. The love and support that I have been showered with by friends, family and strangers alike makes me feel all warm and fuzzy inside. And seeing the emails come in with donations every single day fill me with utter joy. FYI, we have raised $7,642 dollars in 10 days. What the what? Absolutely amazing. As I was boarding my flight this morning, I received an email from the coordinator at Off Track Health asking for information on my skill set, interests and anything area I was specifically interested in helping out with. When I shared that I could speak Hindi and Gujarati (languages that are similar to Urdu), I received an enthusiastic response. There's a need for Urdu translators, and maybe I could try to brush up on my Urdu on my flight over? After a quick google search, I realized that I understood more Urdu than I thought I did--sweet! They're fairly similar languages at a surface level but I might have issues as it gets more technical, but I have confidence that through the limited skills and charades, it will be okay. (It's like American English compared to Australian English--some words are completely foreign, but you can figure it out.) Who would have known that watching all of those Bollywood movies would come into use one day? I'm pretty stoked about being 'useful' even before I get there. So, here I am. Sitting on a couch in Boston. Leaving for Greece tomorrow. Excited. Anxious. Pumped. Overwhelmed. Loved. Supported. Encouraged. Empowered. I'm not alone. Thank you for being there. Thank you for taking this journey with me. Here we go.